Lewis Hamilton cruised to a dominant victory at the Russian Grand Prix on Sunday, capitalising on his team-mates early retirement to extend his Championship lead and effectively shut down any potential designs Rosberg may have had on the Championship. Rosberg had grabbed pole during Qualifying by an impressive three-tenths over Hamilton, having also lead the three practice sessions. 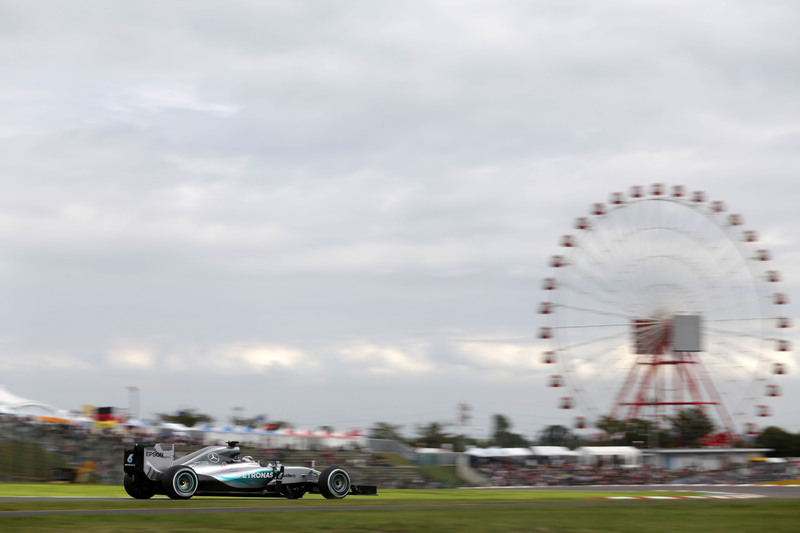 In contrast to his embarrassing show at the Japanese Grand Prix two weeks ago when Hamilton robbed him of the lead into the first corner, Rosberg successfully maintained the lead through the first lap. Although Hamilton was looking somewhat dangerous in the German’s mirrors, any threat was neutralised when Nico Hulkenberg spun off at the second corner and collected the Sauber of Marcus Ericsson, throwing debris everywhere and prompting the Safety Car. While the two aforementioned racers clambered for their cockpit, Max Verstappen hobbled back to the pits with a rear right puncture. With the track cleared the Safety Car pitted and Rosberg led Hamilton across the line. Bottas made a nice move on Raikkonen to reclaim the third place the Finn had taken from him on the first lap, while Hamilton couldn’t pass the Mercedes in front of him. He would not be stuck for long, however, as Rosberg came on the radio to report his throttle was getting stuck open. 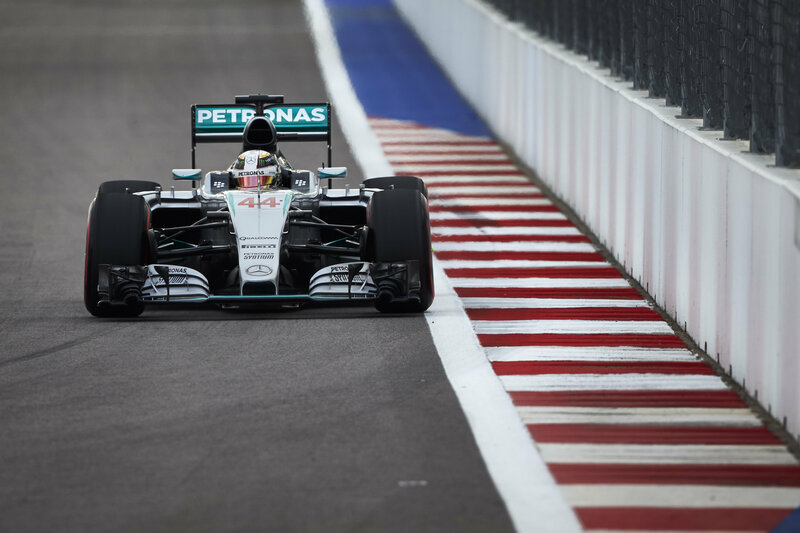 Losing control of his car through most corners, it was easy for Hamilton to slip past him – as did the rest of the points scoring drivers – before Rosberg crawled into the pits. The team assembled around his car and decided they could do nothing to recover Rosberg’s car and retired him from the race. While Hamilton settled into the lead, Carlos Sainz – who 24 hours beforehand had been in a hospital bed following his big FP3 shunt – was making progress and passed Button easily to promote himself to eleventh. The next man to attempt to pass Button was Romain Grosjean, whose attempt resulted in him losing control in the slipstream, get onto the marbles on the fringe of the track which curves left and clout the barriers at a mighty rate of knots. His car spun several times out of the barriers and caused big superficial damage to the bodywork – but luckily the driver was completely okay. Nonetheless, a second Safety Car was needed to clear the debris – and some gaffer tape to repair the barrier! Some drivers took the opportunity to pit for new tyres – but none of the top 8 drivers took this option. Hamilton complained off his tyres going too cold behind the Safety Car but had relatively little hassle from Bottas on the restart. As he stormed into the lead, the Ferraris were battling for P3. Vettel made a move on his team-mate into T2 which left Raikkonen cutting across the run-off area to avoid contact, and retaining his position. He moved aside later in the lap though to allow Vettel up to third, as Kimi had illegally kept the position. Bottas was provisionally second but once he took his pitstop, he came out in eighth. When Vettel pitted two laps later he had successfully jumped the Finn and moved up to second, while Raikkonen emerged just behind the Williams. The two Finns began scrapping for position – a story which would last for the end of the race and end badly for both men. While Perez had held third place for a large chunk of the race, Bottas was hunting him down. It took him several laps to pass the Mexican but he finally wiggled his way up to the rear wing of the Force India and pulled an impressive overtake on Perez. Raikkonen followed the Williams through and demoted Perez to fifth as the Ferrari driver now targeted the Williams in his sights. With one lap left Raikkonen was closing but he pulled an extremely optimistic and amateurish dive on the inside of Bottas which sent Bottas spinning into the barriers and damaging Raikkonen’s car. While an ecstatic Perez drove through the collision and back into third, Bottas got on the radio to ask “what the f*ck” Raikkonen was doing. Daniel Ricciardo and Carlos Sainz also retired just before the checkered flag. Ricciardo appears to have lost his brakes and pulled safely over, while Sainz also lost his brakes but spun backwards into the barriers – ironically at the same place as his shunt on Saturday – which damaged his car and ultimately proved terminal to his race. A fairly large fragment of his front wing was on the racing line after the incident which a brave marshal chose to clear – but this left him ducking out of the way of Vettel’s Ferrari as the German came around the corner and narrowly missed the volunteer. 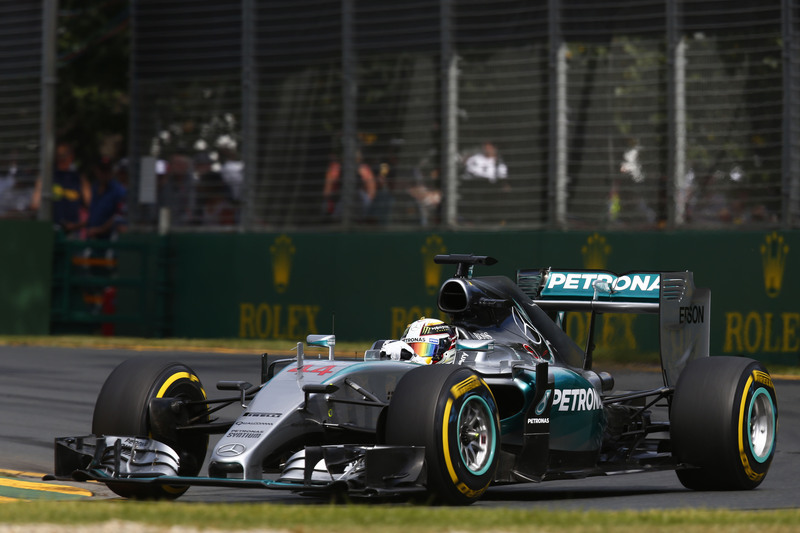 Up front there were no real issues for Hamilton as he breezed across the line to secure his 42nd victory. 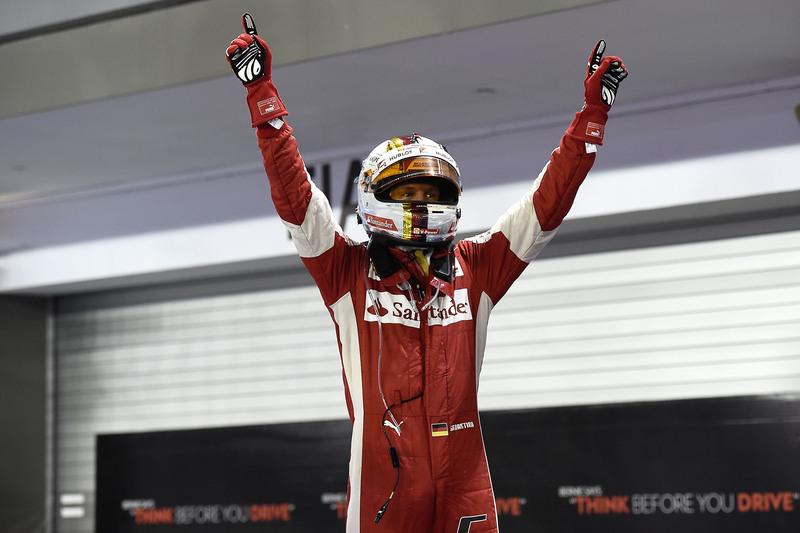 Vettel crossed the line second while Perez gratefully accepted third place. Massa took fourth while Raikkonen finished fifth but will likely be moved down the order when a penalty is applied for his contact with Bottas. Kvyat, Nasr and Maldonado finished sixth, seventh and eighth while the two McLaren drivers secured points with ninth and tenth for Button and Alonso respectively. Verstappen was the first man outside the points while Bottas was classified as twelfth. Merhi and Stevens brought both Manor cars home for thirteenth and fourteenth, the last of the finishing drivers. 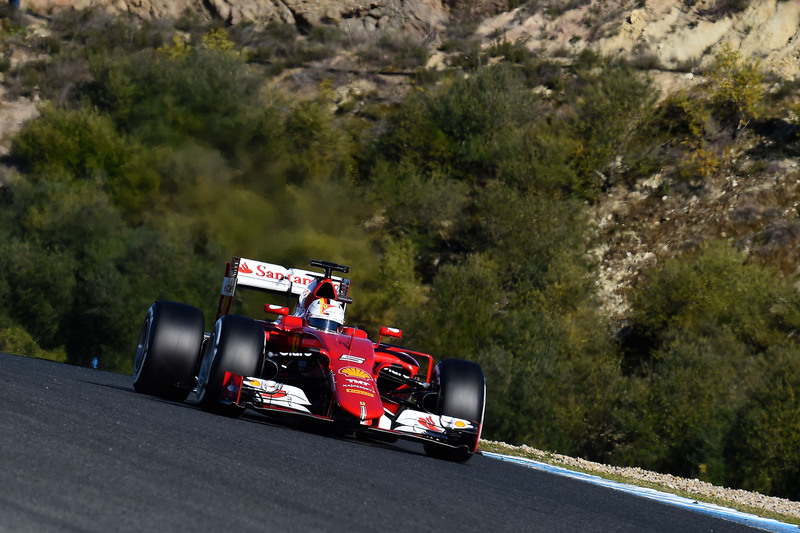 Formula One kicked off 2015 with pre-season testing yesterday, with Sebastian Vettel topping the timesheets for Scuderia Ferrari. Of the seven drivers who completed laps over the space of the day’s running, Vettel’s tally of 60 laps put him fourth overall, but kept him a tenth clear of Marcus Ericsson who took the second fastest time, for Sauber. “Today was a good start,” reflected Vettel when the day’s action had ended, but kept a grounded attitude and admitted: “I can’t say more than that because this is only the beginning. While the exact speed of the Mercedes is so far unclear, Nico Rosberg’s incredible count of 157 laps on what is, for some teams, a chance to see how many times the car can break down, was an ominous sign of the Mercedes’ potential strength again this coming season. While half a second slower than Vettel’s quickest lap, Rosberg said the focus of early testing was reliability. On the difference in lap times, Rosberg added: “As a driver, you always want to find out how quick you are compared to the others – but that will have to wait until qualifying in Melbourne. Marcus Ericsson’s first day of running with his new team also showed positive reliability and he clocked 73 laps overall, tied second with Williams’ Valtteri Bottas. The Swede, formerly of Caterham, was clearly pleased with his first experience of the Sauber on track, and praised the reliability of the car under various set ups. Bottas also clocked 73 laps over his track time, and like Ericsson, the Finn seemed happy with his first taste of the FW37. Beginning with shorter stints, Williams began to build up to longer runs, and were happy with the car’s reliability, Bottas said. “The day started off a bit slow, but it turned out to be a really good one. After that initial set-back, we didn’t have a single issue with the FW37, which is impressive for the first day with a new car. “We know we have a lot to learn and improve, but we also know where these gains can come from, and have work to do with the car performance and the power unit. There are a lot of strengths in this car and we’ve made good progress in just one day, so I am very pleased,” the Finn concluded. Ricciardo was similarly happy with the performance of the car, saying: “We got going pretty well this morning and I got a few laps under my belt. So the first impressions are good. We’ll get a few more laps over the next few days, but so far everything seems pretty encouraging. Over at Red Bull’s sister team, Carlos Sainz Jr. took the RB10 for a noble 46 laps around the Circuit de Jerez. Although he had run in a filming day already this year, rookie Sainz felt positive about the Toro Rosso’s first proper shakedown. “We worked well together as a team,” commented the Spaniard. “I felt good in the car today, I was constantly improving, lap after lap. We did some adjustments and I think we have a good starting baseline”. Sainz’s country-man, Fernando Alonso, had the least successful day of any of the seven drivers, completing a mere six laps on the first day of his return to McLaren. Although alleging to have purposefully run a series of short stints, with the longest run being three laps, McLaren’s day of testing finished at lunchtime when a technical gremlin took the car out of action for the afternoon. While McLaren’s day ended early, neither Lotus nor Force India made it to Jerez in time for the beginning of testing. While Lotus’ trucks crawled into the pit lane in the afternoon, Force India’s were nowhere to be seen as it was confirmed that they would not be attending the test. The team have also moved to rubbish rumours that their car, again piloted by Nico Hulkenberg and Sergio Perez, will not make it to the grid for the curtain-opening Melbourne Grand Prix on March 15th. Pre-season testing continues on Monday with Lewis Hamilton, Daniil Kvyat Valtteri Bottas, Kimi Raikkonen, Jenson Button, Max Verstappen and Felipe Nasr all piloting their respective cars. 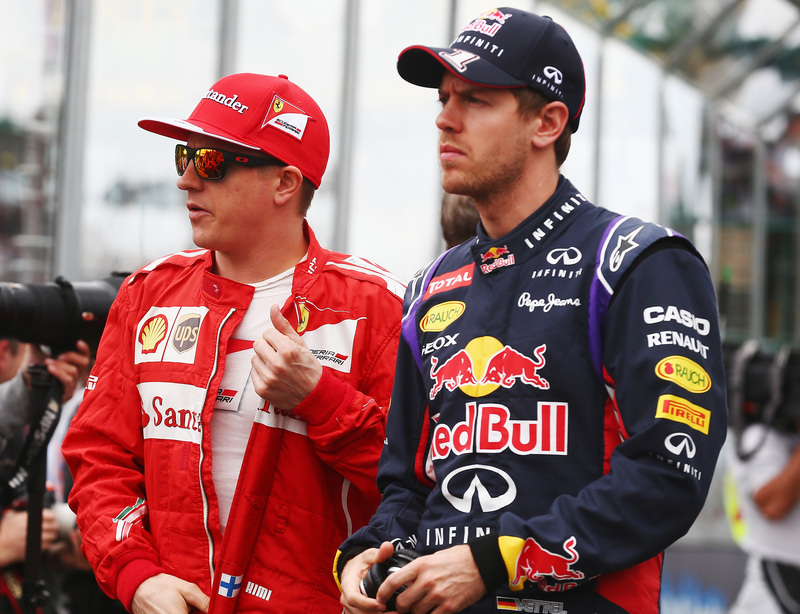 The worst kept secret in Formula One has been officially confirmed today, with affirmation from Ferrari that four-time World Champion Sebastian Vettel will partner Kimi Raikkonen at the team next year. Vettel rose up through the junior formulae under the guidance of the Red Bull Young Driver programme, but this year announced his departure from Red Bull. And with Red Bull Team Principal Christian Horner announcing that Vettel would be a Ferrari driver at the Japanese Grand Prix in October, the resulting drawn-out wait had an inevitable end: official confirmation from Ferrari. That confirmation came today with the declaration of a three-year contract alongside Kimi Raikkonen, who currently holds a contract until the end of 2016. Reportedly, Red Bull reserve driver and reigning World Endurance Championship Champion , Sebastian Buemi, will also move to Ferrari as a reserve driver, at the request of Vettel. “The next stage of my Formula 1 career will be spent with Scuderia Ferrari,” Vettel said in a Ferrari statement this morning. “And for me that means the dream of a lifetime has come true. Ferrari Team Principal, Mario Mattiaci, added: “In Formula 1 terms, Sebastian Vettel is a unique combination of youthfulness and experience and he brings with him that sense of team spirit which will prove invaluable when, together with Kimi, they tackle the challenges awaiting us, as we aim to be front runners again as soon as possible. Meanwhile, Fernando Alonso remains tight-lipped over his future. McLaren, the team many expect him to return to, this week decided to prolong their driver announcement until after the Abu Dhabi Grand Prix and subsequent Young Driver Test. If not returning to McLaren, another suggestion which has gathered air is that Alonso could follow in his friend Mark Webber’s path, and leave F1 for the WEC.